It seems that all has been said on the fig theme, from the gold standards L’Artisan Premier Figuier and Diptyque Philosykos, to the surprisingly creamy milky-woody Hermès Un Jardin en Méditerranée; from the fresh and musky Marc Jacobs Men to the retro floral Ellie by Ellie D. Although these selections merely highlight some of the most interesting modern compositions, one thing is certain—fig is a note that has been used extensively over the past decade, both in niche launches (Nez à Nez Figues et Garçons) and in big prestige releases (Thierry Mugler Womanity.) 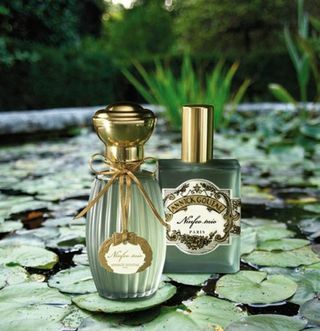 Yet in studying Ninféo Mio, I was amazed to discover that Isabelle Doyen, Annick Goutal’s in-house perfumer, once again managed to create something interesting and unusual, an elegant woody fig with a surprisingly strong green character. For one thing, Ninféo Mio diverges from many woody figs in its dramatic use of green notes. The green accent is not the pretty shimmer of a grassy green, nor is it an evanescent and sheer green citrus. Instead, it is vivid, bitter and intense, reminiscent of the dramatic power of the original Balmain Vent Vert. This verdant accord has a beautiful presence throughout the composition, from its initial explosion in the top notes formed by petitgrain and galbanum, to the heart, where lentisque and leafy notes provide the main character. Herbaceous accents lend an aromatic, classical cologne character, while the use of modern woody aroma material removes any retro associations. The bitter citrus facet is pushed to the limit: a few parts more and the composition would have taken a distinctly pungent, sulfuric turn. As it is, the bitterness is quite alluring, keeping one in suspense as to what might come next. Compared to excellent figs like Hermès Un Jardin en Méditerranée, L’Artisan Premier Figuier, and Acqua di Parma Blu Mediterraneo Fico de Amalfi, Ninféo Mio lavishes more attention on the citrus-woody accord. While fig is a supporting player, its role is important, as it lends a pleasing, milky softness to what could have been an overly green composition. The lasting power and diffusion of Ninféo Mio are very good, especially for a composition in its fragrance family. I find that even at the end of the day, I am still conscious of the woody-green drydown. Of course, my favorite part takes place within the first hour of wear, when the bright, green hesperidic notes start to give way to the seemingly endless layers of aromatic verdancy. At that point, it truly feels like a breath of spring air. Ninféo Mio includes notes of citron, petitgrain, bergamot, bitter orange, galbanum, lentisque, lavender, fig leaf, verbena and lemon tree wood. 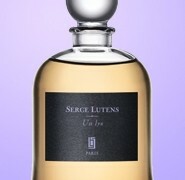 Since it is unisex, it is available both in square and ribbed bottles. Annick Goutal fragrances are available from Aedes, Neiman Marcus, Nordstrom, Saks5thAvenue, Bloomingdales as well as online from Beauty.com. Zazie: I bought a bottle of Ninfeo Mio on a whim, and I am so happy I did: it really smells like spring to me. I should add that it’s the only fig scent I enjoy – fig is a pleasant note but I don’t associate it with the concept of personal fragrances. You know, I used to think exactly the same thing about the house, but when I visited their boutique in Paris, it all somehow fell into place. And then learning more about the house and the woman who inspired it. I felt such admiration for Annick Goutal. jb: I am an annick goutal fan. I remember buying my first AG — Nuit Etoilee such lovely mint and pine fragrance. Cornelia Blimber: I am so happy with this perfume! had big luck finding testers of Quel Amour! and Ninfeo Mio. I love bitter perfumes, and Ninfeo is one of the best. Cornelia Blimber: I don’t know how it was in the past, I discovered Annick Goutal recently. I never liked her perfumes..that bottle, that bow…and all had to my nose the same drydown. I must confess I only knew a gardenia and a few other florals. Mon Parfum Cheri Par Camille was a camphoric and chaotic horror to my nose. But recently I was given samples of Nuit Etoilée , Songes, Rose Splendide and Grand Amour. Songes I didn’t like (too sweet) but the others made a Goutal lover out of me. Inspired by Elisa’s post on geraniums I tried Quel Amour! and loved it instantly. As Hamamelis says: a most happy perfume. And at the same time I purchased Ninfeo Mio. Very comfortable in the moist hot weather we have now in the Netherlands.